First Report of the Auxiliary Branch Bible Society of Van Diemen’s Land. 1819. With a List of Benefactors and Subscribers. Hobart Town: Printed by A. Bent, Government Printer. MDCCCXIX. 24p., 21 x 12.6 cm. Mitchell Library copy has plain paper cover. Andrew Bent signed up for an annual subscription of one guinea. A meeting on 8 May resolved that a report, with an account of the receipts and remittances, be published annually, for the satisfaction of subscribers; that the resolutions be printed and published, and a copy of them transmitted to the Patron of the Auxiliary Bible Society of New South Wales. Another on 10 May that as soon as the resolutions now and before passed shall have full effect, and the reports of sub-committees shall be collected, a statement of the proceedings shall be printed in a small tract, for the information of Benefactors and subscribers, and of the public. Rules and Orders of the Lieutenant Governor’s Court, in Van Diemen’s Land. Also, a Table of Fees; to be taken by the Officers of the Court. Published by order of the Deputy Judge Advocate. Hobart Town: Printed by Andrew Bent, Government Printer. MDCCCCXIX. 14,  p., 21.3 x 12.7 cm. Printers’ error in date. DC and TNA copies have dark green covers. The Lieutenant Governor’s Court was established in 1814, and the Deputy Judge Advocate was Edward Abbott. Annotations on ML copy may be by Edward Abbott Jnr., who was an officer of the Court in which his father presided. Digital version (Dixson Library copy) is available. Second Report of the Auxiliary Branch Bible Society of Van Diemen’s Land. 1820. Hobart Town: Printed by Andrew Bent. MDCCCXX. 24p., 17 x 11.3 cm. Blue paper wrappers. Accounts in the third report show that Bent was paid £8.12.6 for printing 200 copies of the second report and other printing work during the year. 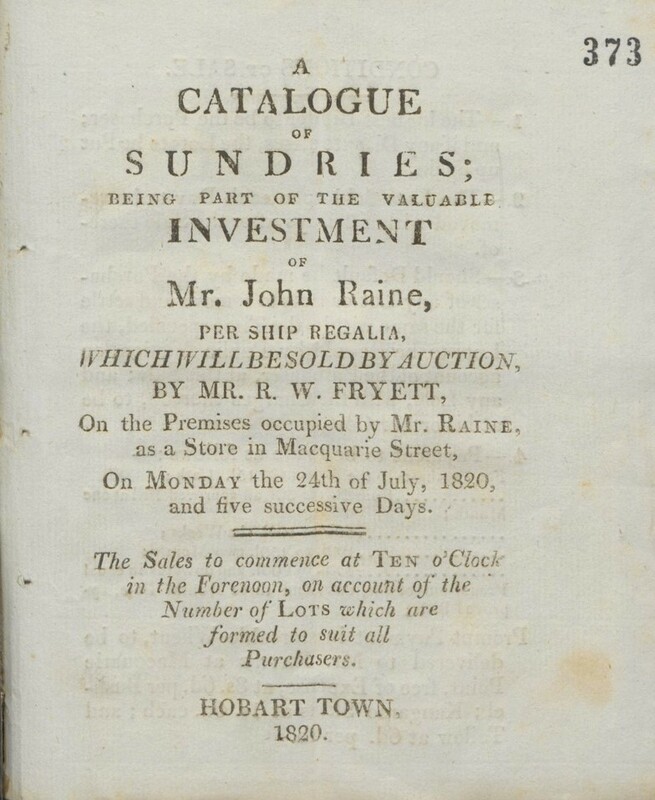 A Catalogue of Sundries; being Part of the valuable Investment of Mr. John Raine, per Ship Regalia, which will be sold by Auction, by Mr. R. W. Fryett, on the Premises occupied by Mr. Raine, as a Store in Macquarie Street, on Monday the 24th of July, 1820, and five successive Days. Hobart Town, 1820. 20p., 15.5 x 11.5 cm. (approx) Colophon: A. Bent, Printer. The first catalogue printed in Tasmania. 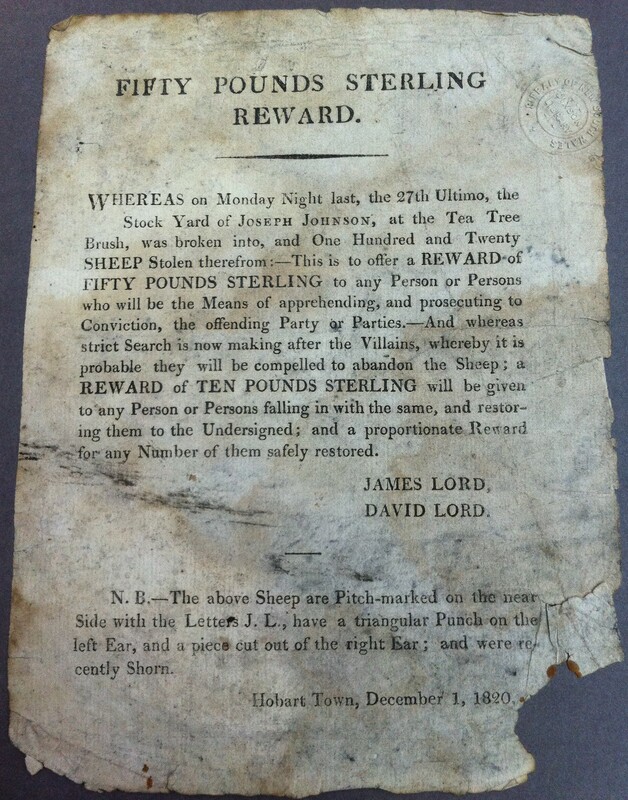 Fifty Pounds Sterling Reward [offered by James Lord and David Lord for information on the theft of 125 Sheep at the Tea Tree Brush on 27th Nov. 1820.] Dated Hobart Town, December 1, 1820. Broadside, 21 x 15.2 cm. Laid paper. Water mark includes a lion and a unicorn.